Swing into spring with fun activities bursting with Easter surprises. Decorate eggs, make pop-up chicks or bake a yummy cake! Or why not wear a bright Easter crown, or hang a colourful garland from the ceiling? 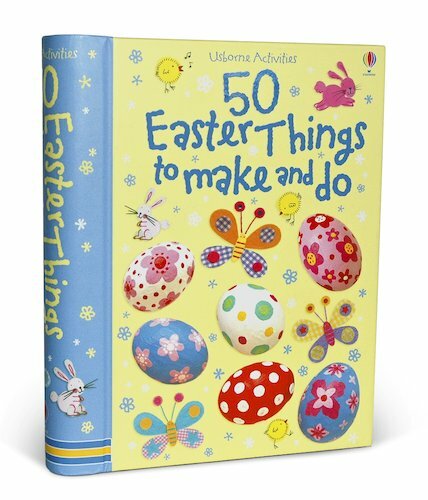 Each idea in this fresh little book is inspired by Easter or the spring season, and comes with easy instructions and colour pictures to get you started. With fifty cheerful suggestions to perk you up whatever mood you’re in, it’s time to celebrate Easter! With Easter just around the corner, this is the perfect source of ideas great ideas for fun things to make and do in the run up to Easter. Projects include decorative Easter garlands, fingerprint bunnies, a hatching chick card, decorated eggs and lots more. Clear step-by-step illustrations and instructions help children to make exciting Easter projects and gifts. If, like me, you struggle for inspiration to keep the dreaded boredom at bay during the Easter break, this is the ideal choice for achievable ways to keep them entertained. I looked at it and red it. AWESOME! ME AND MY MUM WILL HAVE MANY FUN HOURS MAKING EASTER STUFF! I WANNA BUY IT! I like this book as its fun and has lots of great things to do. It will be great to make some things when the weather is bad with my little brother. I love easter time so this is a perfect book for me!